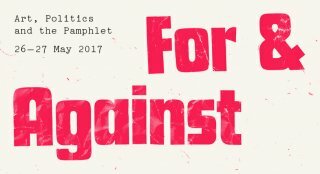 For and Against: Art, Politics and the Pamphlet is a two-day research and public ‘festival’ event responding to research into the political pamphlet and exploring the relevance of the pamphlet for contemporary art practice. This day-long event takes place across sites in Loughborough. It will involve live performative elements by artists commissioned by Radar and a ‘market’ of stalls where public participation in the making of new pamphlets, zines and protest paraphernalia is actively encouraged. Join us! FREE, no need to book a place, just turn up!